The guideline was commissioned by the Saskatchewan Senior Medical Officers Committee and the Transfusion Medicine Working Group (TMWG) as a resource for Saskatchewan Regional Health Authorities (RHA) to support safe client centered care. Health Canada regulates transfusion practice in Canada under the Food and Drug Act with the Blood Regulations. Health Canada commissioned the Canadian Standards Association (CSA) to develop a document, CSA Z902 Blood and Blood Components to assist facilities to become compliant with the Blood Regulations. This guideline supports implementation of the CSA Blood and Blood Component Standards in the setting of elective community transfusion. 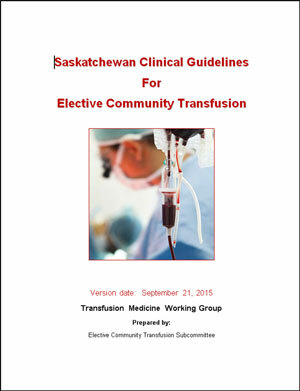 The Saskatchewan Clinical Guideline for Elective Community Transfusion was developed by a multidisciplinary subcommittee including a registered nurse representing the Saskatchewan Registered Nurses’ Association, a registered nurse representing rural facilities, medical laboratory technologists representing the TMWG, an Emergency Medical Services (EMS) rural representative and a Transfusion Medicine Consultant. This guideline outlines the minimal safety standards under which an Elective Community Transfusion Program can be delivered in compliance with the Health Canada Blood Regulations. Each RHA must meet but can exceed the requirements within this guideline.